License: CC-BY-NC (-attr is implied). We live along the Ouachita River, downstream of Lakes Ouachita, Hamilton, and Catherine. 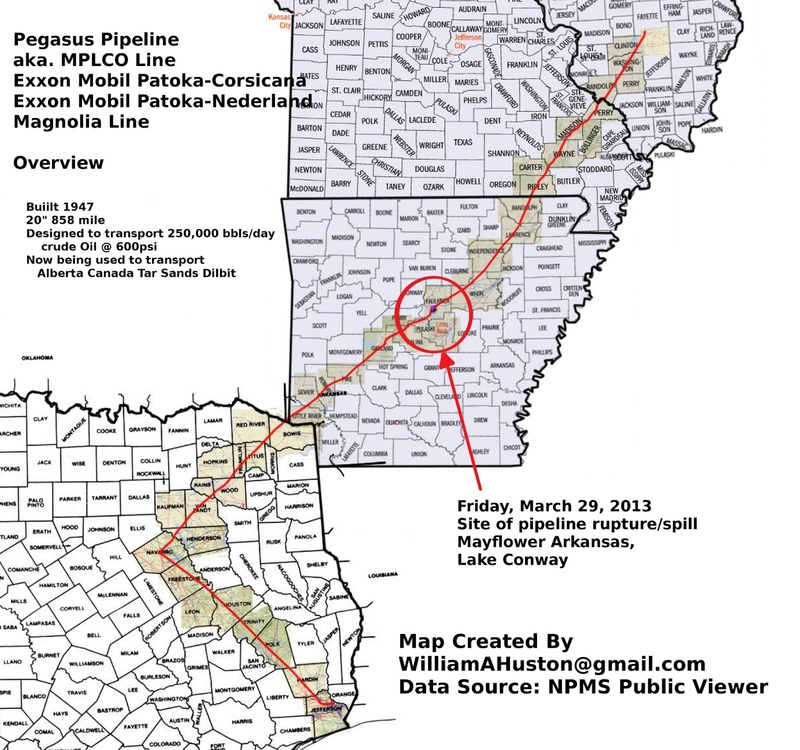 Could you provide specific coordinates (long-lat) where the Pegasus Pipeline crosses the river. 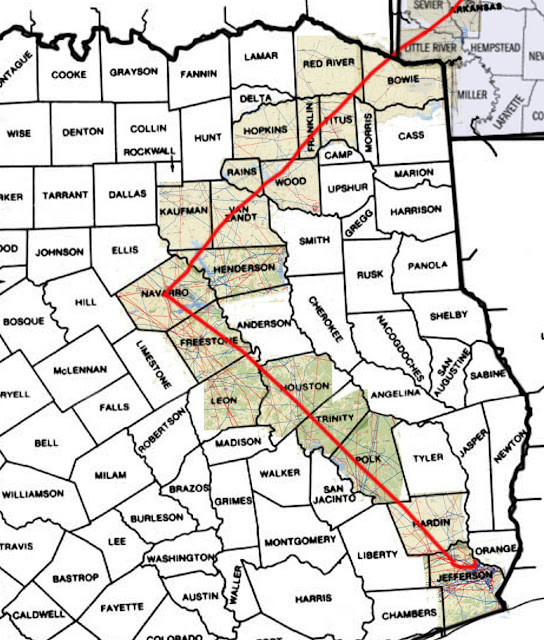 The maps are too coarse to determine specifically, but the pipeline appears to cross down from Blakely Mtn Dam (upper reaches of Lake Hamilton). Lake Hamilton is an important residential and recreational lake, and part of Hot Springs water supply is drawn from that portion of the river. I have heard that the Central Arkansas Water System has requested rerouting of the Pegasus to protect the Little Rock water supply (Lake Maumelle watershed). Please respond to this email address or bashman@earthlink.net. 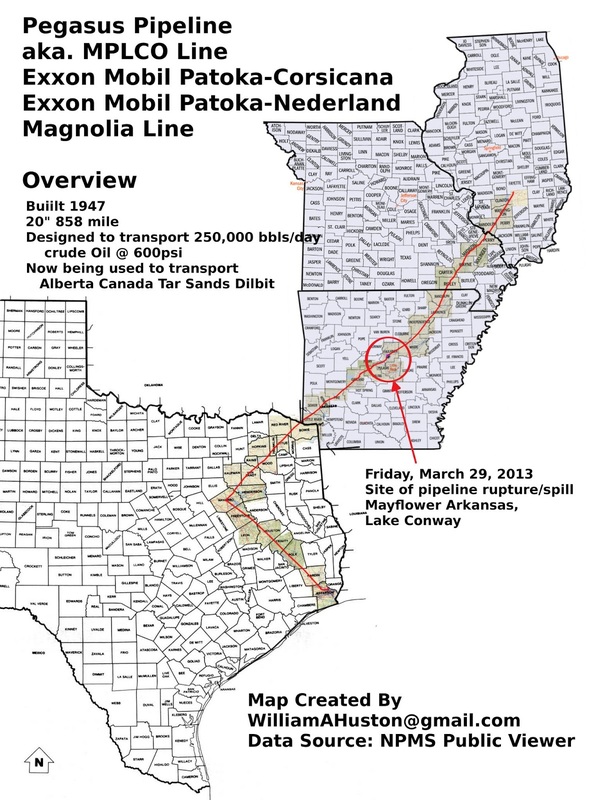 Thanks for the quick work to help us understand the potential impacts of future spills from this pipeline. Jeff Short, Corresponding Secretary, Ouachita River Park Commission. Joye or Jeff, I do not have that information. The best source of public information is the NPMS Public Viewer. It's part of PHMSA. It's not very high resolution, the browser is clunky, it's only transmission lines (we're in luck here w/Pegasus), you can only see one county at a time, and the maps seem intentionally distorted. do you know where i could find a map of the locations of the shut off valves for the pegasus line in arkansas? 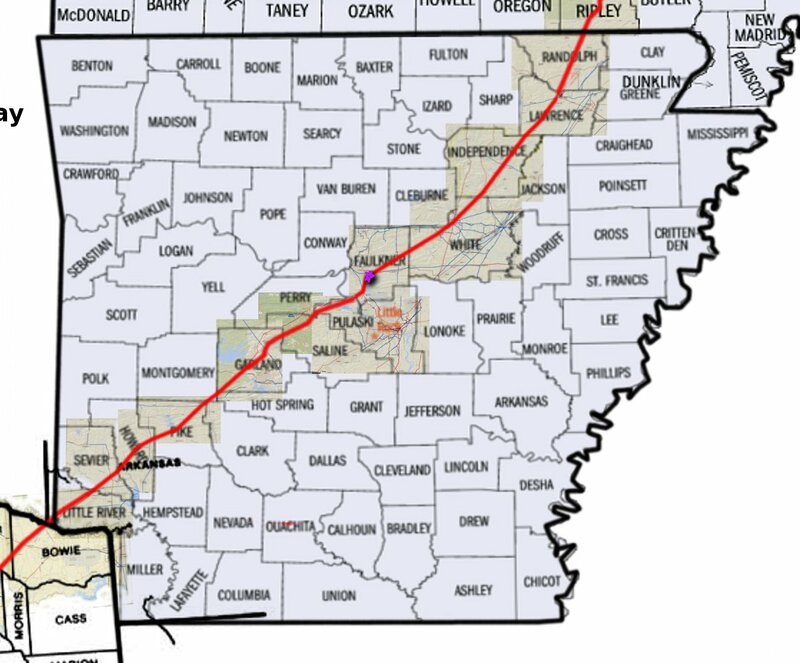 where would i find a map of where the shut off valves are on the pegasus in Arkansas? Genieve Long -- I am looking for the same thing. If you find the source, let me know. I am specifically looking for the location of the valve downstream from Mayflower. I had it once, but can't find it now. That is the downstream valve. 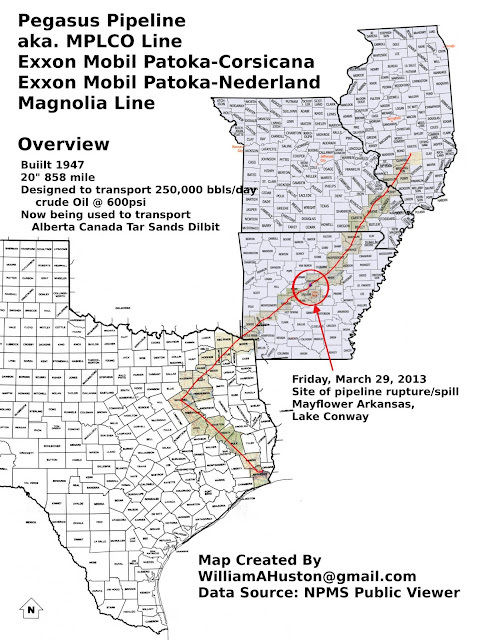 According to this document, the upstream valve is 95,040 ft away, which is 18 miles. The Conway compressor is at 35.125,-92.28, but it's much farther away. It's about 28 miles as the crow flies. 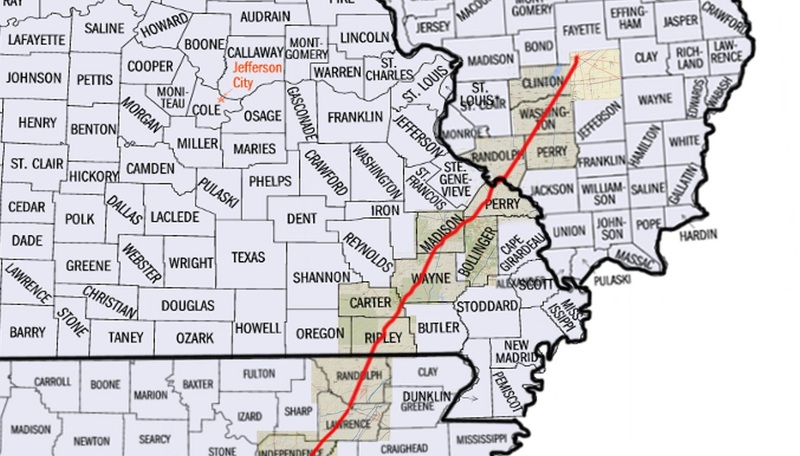 I'd estimate between 35 and 40 miles of pipeline. I have located two possible locations for the upstream cut-off valve. This should be verified by Exxon Mobil documents. Can I ask how you stitched together the county maps from the NPMS viewer? > Can I ask how you stitched together the county maps from the NPMS viewer? My God, it took me a solid day's work. 24 hours straight. I first started with a very high resolution of the outline of each state w/counties, like maybe 5000x5000. Then I took screen grabs of NPMS using GIMP. Scaled it to the base map, then extracted just the red and blue components. The worse part was, after I got it all done, I was so exhausted, I typed the wrong command, and I lost the source image with all the layers. But at least I got it done. Seems stupid really. I shouldn't have had to do all that work. PHMSA should make a better browser available to the public. Wow! Good job! Thanks for responding.